Synchrony leverages data and innovative technology to help shape the future of payments, but the business needed an ownable idea that would demonstrate its insights and capabilities to key audiences: the business owners, executives, and emerging leaders who represent its customer base. Enter State of Pay (SoP) with Synchrony. The idea came from a simple insight: Ce––analysis and expert points-of-view about what’s now, near, and next. In March 2018, Synchrony created a multi-platform content franchise that delivers thought leadership and big ideas from some of the brightest minds in payments, retail, and tech. Leaning into its business-savvy audience, Synchrony leveraged CNBC’s vast reach and ability to deploy social video, article content, and linear TV promotion to business professionals. 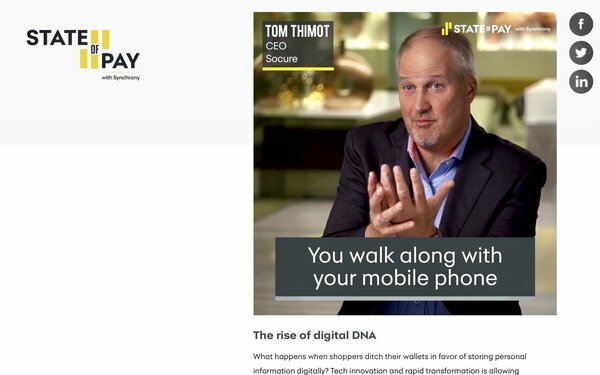 The ecosystem was distributed content across CNBC and Synchrony social channels, an online content hub, www.cnbc.com/stateofpay, and through experiential activations that made our audience part of the experience. The program launched at retail and ecommerce conference Shoptalk. The Synchrony Studio, a newsroom-style set on the conference showroom floor, broadcast live Facebook interviews of industry experts conducted by journalist Bobbi Rebell. SoP also captured insights and trends at the Women in Retail Leadership Summit, Money 20/20, the Collision Conference, and Synchrony’s own Envision Conference, which informed a steady cadence of written and video content that was both timely and evergreen. Over the course of nine months, SoP featured nearly 40 experts, including executives from Amazon Pay, Microsoft, PayPal, and The Container Store. To reach your audience, find a media partner that caters to it. Use social media to broadcast advice from experts in your industry. Share wisdom gained from conferences where the latest trends are discussed. This won the Business Media category in MediaPost’s 2018 Creative Media Awards.